Uncategorised Who knew the zombie apocalypse would be so much fun? It’s Saturday afternoon and a crowd of twenty-somethings are listening intently to a tall man holding court in the corner of a pub. That man is Richard Wheatcroft, the events director of Requiem:Live, and he’s in the middle of what will easily be the most surreal team-talk in the city today. King Power and Welford Road have nothing on what’s being heard upstairs at Firebug in Millstone Lane. And this, dear reader, signals the preliminary work behind Leicester’s most original night out – Zombie Earth. It’s a live action adventure which sees apocalypse survivors take on the animated undead at atmospheric locations across the city. 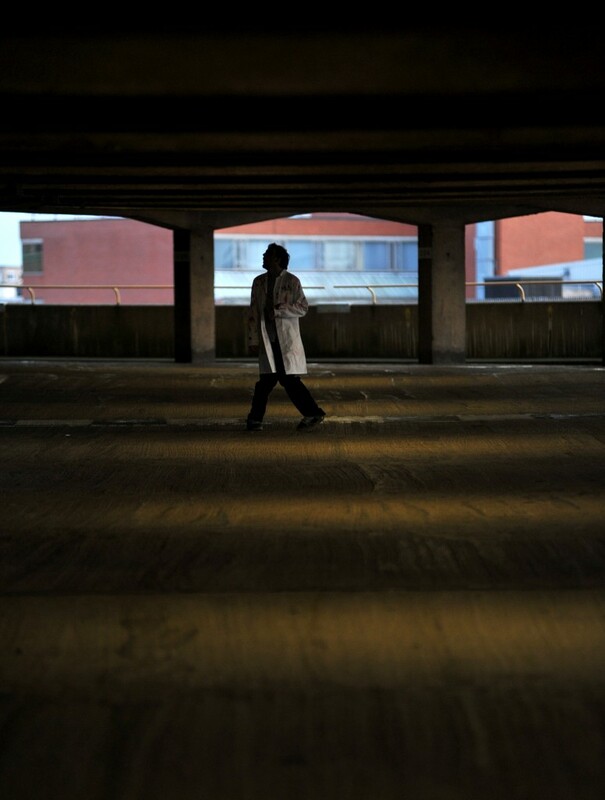 “Leicester is a moving house of horrors and survivors have to get from co-ordinate to co-ordinate to get to the survivors’ base,” explains Richard to those who will form the backbone of the experience – the zombies. Come the following weekend, there will be 160 survivors hoping to dodge these volunteers to avoid becoming a human Happy Meal. And with that in mind, Richard picks a person at random. “This is what a zombie infection looks like,” he smiles, tagging his volunteer lightly on the shoulder. I’m now left with the choice: survive the apocalypse or join the undead? Ed Astill from Birstall, a support worker for disabled people, opts for the latter. The decision to go pulse-free comes after being a survivor at April’s pilot event. “When we first started it was a bit scary because we heard a few noises. They were typical zombie noises – screeches. Zombie Earth comes to Leicester when putrefying flesh is very much in vogue. Walking Dead has just finished its third season. 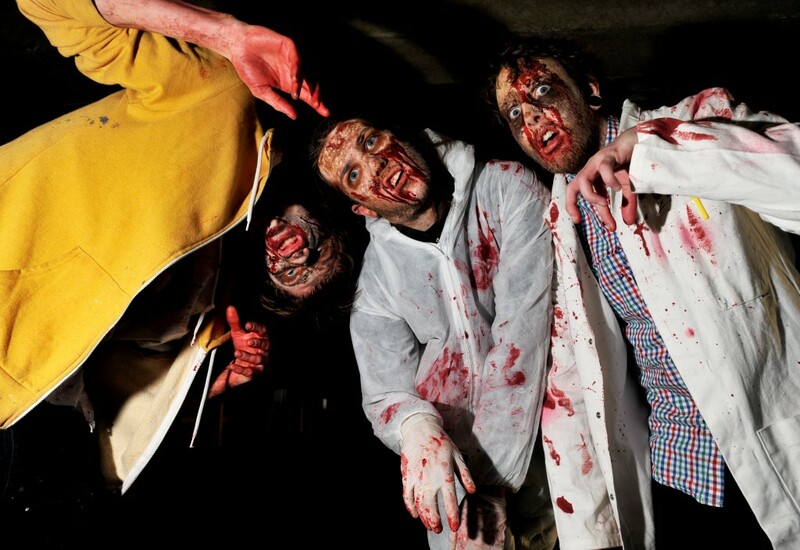 The BBC recently put out three-parter In The Flesh, about medicated zombies filtering into society. Both arrive after well-received zombie films Shaun of the Dead, Zombieland and 28 Days Later. Back in Leicester, a lot has gone into making people shriek like the front row of a One Direction concert. Oliver Snedker is Richard’s right-hand man. He’s right. 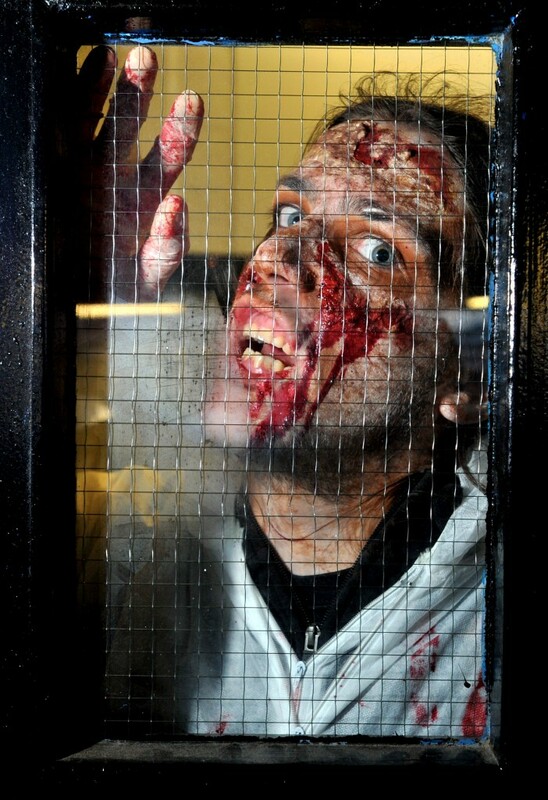 The eighth UK Festival of Zombie Culture will take place at the Phoenix Arts in November. As a start-up firm, Ollie and Richard have a lot riding on the next few events and £10 million in liability insurance. But, says Ollie, the public response has been encouraging. With Richard’s heads-up at the pub over, we head to Bede Island to bust some zombie moves. There are two types of zombie at Zombie Earth. Type one is the Walking Dead or Shaun of the Dead zombie, a foot-dragging straggler. Deploying a brisk jog should effectively extinguish their threat. Type 2 is the 28 Weeks Later variety. The Zombieland zombie. They have a bit more pep. They can run. There are four undead walks. The classic backfoot drag, the inward foot drag, the knees-in feet-in walk, more commonly favoured by toddlers with full bladders. 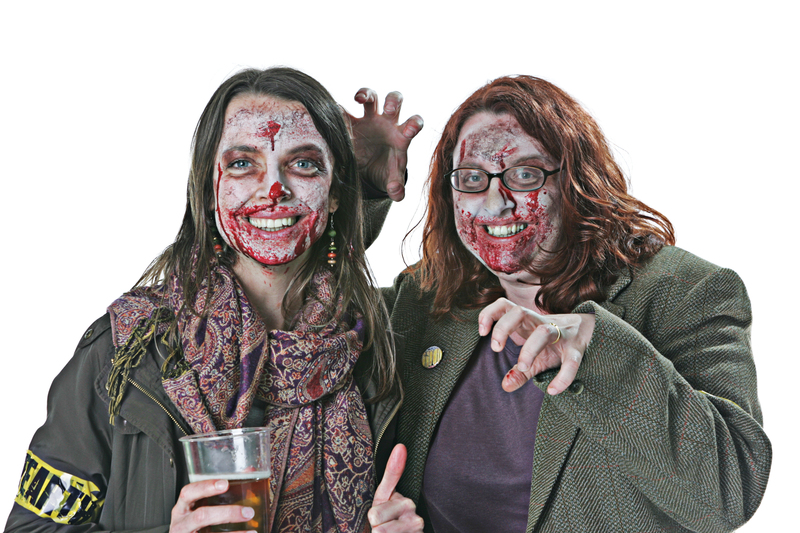 “The last one is my favourite zombie walk – the stoner zombie,” smiles Richard. At which, he stumbles forward with his shoulders pitching left to right while balancing on tiptoes. 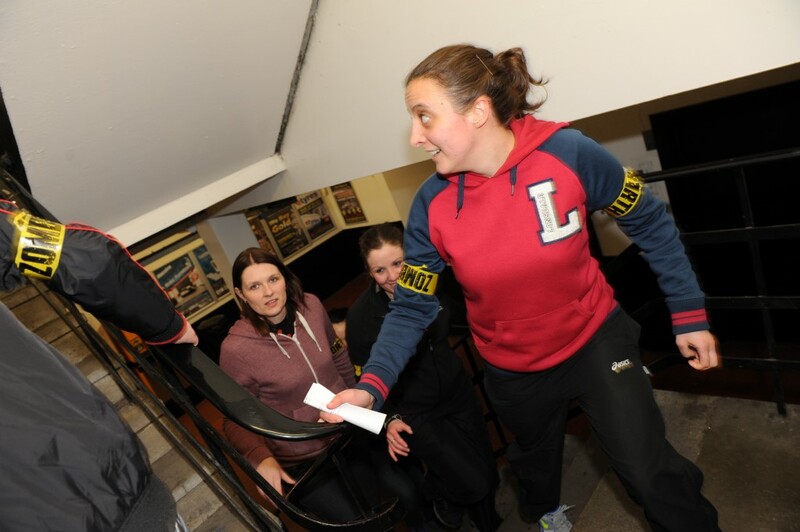 With a run-through, a few practices at making zombie noises, good advice such as “zombies don’t laugh, smile or have tight shoulders”, the group is well on its way to scaring next week’s paying punters. “One of the locations we used last time was an empty warehouse, with just one light and we filled the building with smoke,” adds Ollie. He saw two female survivors run in and seconds later run out again, crying. “How’s that for an experience?” he beams. Suddenly, a young man in a black trenchcoat sprints past zombie-style. In broad daylight it’s still slightly unsettling. “Just wait until you see them in make-up,” grins Sian. And so it begins. 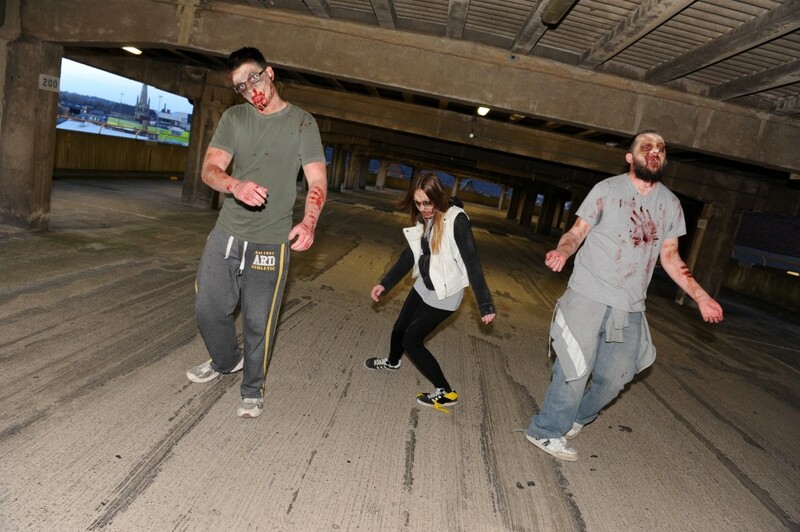 It’s 7.15pm on Friday, May 3, and our group of Zombie Earth survivors are at Short Street car park. We find our reception committee in bulky head-to-toe military camouflage. Up until now, the anxiety caused by Zombie Earth has, for me, all been clothing-related. What does one wear when running for one’s life? I opt for combat trousers and knackered Reeboks. My companion Sian Brewis arrives in tweed and trainers. In our group, there’s Sian, friends Gemma and Craig [ex-Army] and Luke, Jack and Josh, from the Porsche Centre in Thurmaston. There is also Nate and Chris, from Nottingham, they’re here for Chris’s birthday surprise. Yes, it was a surprise. We’re given a pep-talk, a map to reach the survivors’ base, our first location and that’s it, we’re off. Our first stop is Lee Circle NCP. Our co-ordinate is somewhere on the upper three floors. And so are the zombies. If you know Lee Circle you know it’s scary without the prospect of being eaten alive. And this is where it starts to get interesting. In the confined stairwell, we can hear shrieking. It’s then we see one of them, lurching past the reinforced glass in a heavy iron door. The mood is changing rapidly. We shuffle out in a tight nucleus on to the second to top floor. I don’t see the zombie in white scrubs – an undead dentist – but the rest do. At that, the group bolts. The sound is sports shoes skimming concrete. You run because your brain is telling you to run. You want to stay in the group because you know it’s safer and, at the same time, there they are, three very unhealthy-looking zombies up ahead, and you have to get past them. We see chalk on a pillar – N9 – and assume this is our next co-ordinate. And then we sprint downstairs, adrenaline pumping. Our next location is a smoke and strobe-filled room near Phoenix Arts. The doors open and we’re in. Sprinting. 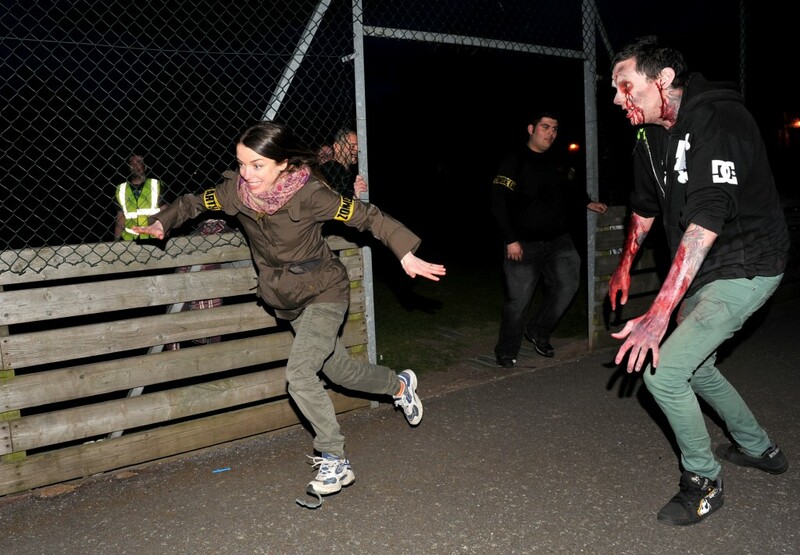 I see a zombie up ahead and try to outrun it. At the last second I realise it’s me, and that I’m running full speed into a giant mirror. With a significant chance of literally joining the deceased. I squeeze through three converging zombies and opt to use, well, an old Jedi mind trick. Which really just means me telepathically suggesting “there’s nobody there”. Skimming past, they switch direction. Ah. And there’s Sian behind me. Chomp. We get the next co-ordinate and head for New Walk. Just outside the museum, two “survivors’’ are anxiously looking for their group and give us the new location. It’s Regency College. As we walk in, the sun now setting, we can see the slow-moving outlines of silhouetted flesh-eaters. The plan is to go on to the college tennis court and retrieve the co- ordinate. “Arrr, you’re really beautiful,” coos Josh to a zombie poking through a hole in the fence and clawing at the air. There’s a flurry of activity as people sprint on to the court. Jack runs in as a diversion, Luke sprints out, triumphantly holding the cone with our next co-ordinate. “We went to Yates’s first and had a pint of Red Bull,” reveals Josh. But where’s Sian? Poor Sian. She’s the last one in and surrounded. Chomp. The post-stress giggles accompany the walk to the next co-ordinate. And then we see a tiny, middle-aged Asian man in a fluoro waistcoat. “Yo yo yo,” greets Luke. As it turns out, this man has nothing to do with the game. We find the proper warden, also in a fluoro bib, leaning against the giant wall of HMP Leicester. He’s been bitten, he tells us. And asks for a fag. And this is where it gets hyper-surreal. For the next location we’re in the cobbly domain of Leicester Castle and 900-year-old St Mary de Castro. On the lawn here they used to execute people. It’s narrow, it’s dark and it’s very, very scary. We walk in to a symphony of zombie screams. And, deep breath, we take our timorous steps beneath Rupert’s Archway. The plan now is to sprint like fury. But, alas, I see him too late – a life-like zombie priest. Oh no. It’s not a zombie priest! It’s a real priest! I body swerve at the last second and he offers a steadying hand as I hurtle past. In a stroke of serendipitous timing the service at St Mary’s has ended and survivors and zombies and worshippers and ordinary passers-by are thrown into the mix. And then it happens, I run into a real zombie. Chomp. Via 2,000 year old Jewry Wall, we head to the lockups of the Great Central Way viaduct. It is at this stage we find ourselves in the middle of what appears to be a zombie rave. It looks terrifying – it’s a 300 metre turkey run to safety. Oh look – a spider zombie. WTF. After navigating the rave like a bunch of startled toddlers we all collapse in a heap outside The Ship Inn, where the actual landlord, deserving of an Equity card, gives us the next destination. 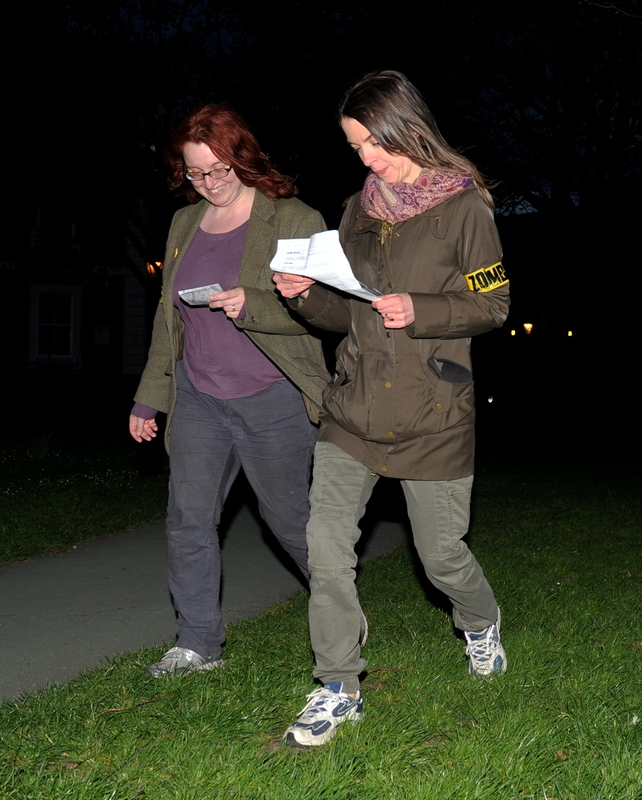 Which we pursue… after a well earned pint. After two and a bit hours on the hoof, we reach the survivors’ camp. 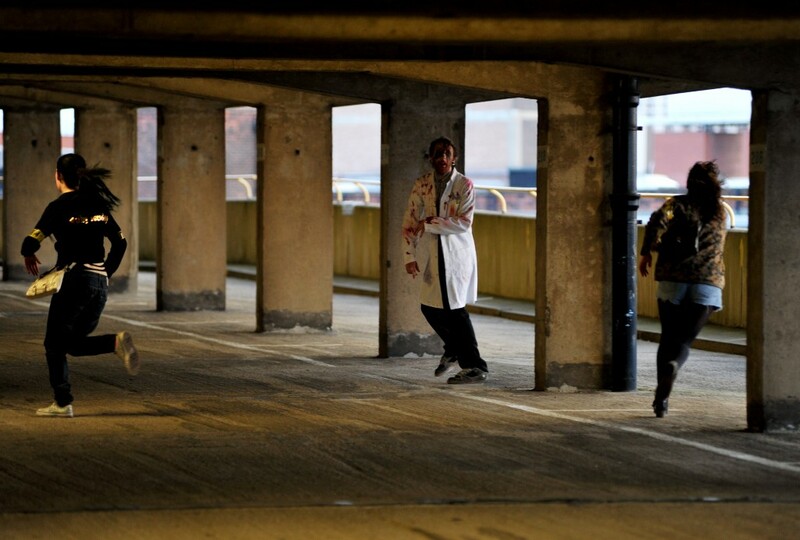 It’s bad news for the infected who are ushered off… to give any more details here would spoil it. And then we conclude with the zombie apocalypse party at Mega Zone, a laser tag venue where, bizarrely enough, the undead, the newly dead and the victorious living mingle as one. Just one thing concerns me and Sian now – and that’s hailing a cab home. Written in April 2013. Text and images courtesy of the Leicester Mercury.